During our recent mission trip to India I took about 600 photographs. This Hindu worship center in Varanasi, on the Ganges River (pictured below) was one of the most beautiful. This site is the epicenter of worship of the Hindu god Shiva, the Destroyer, on the bank of the Ganges River, the “mother of life” to Hindu worshipers. In the area known as North India, less than one percent of the population of millions is Christians. 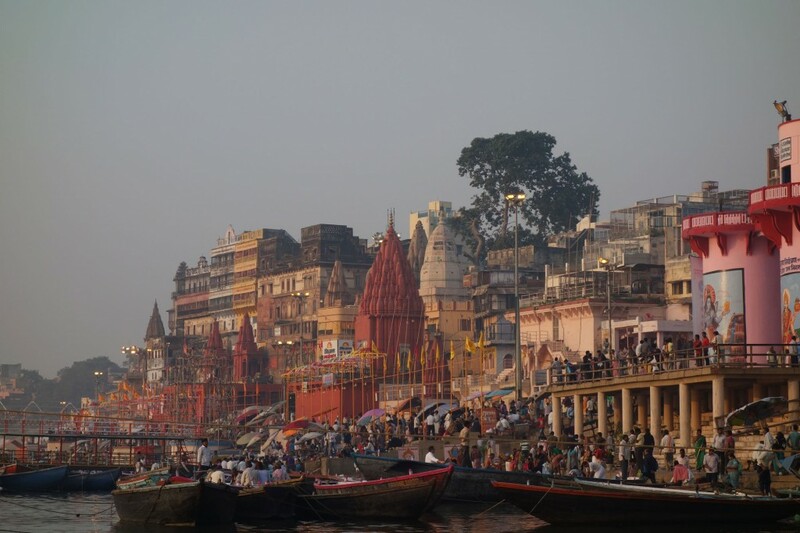 The city of Varanasi and places like it across North India are known as the “graveyard of missions.” Varanasi is the oldest known city in India, dating back an estimated 4 – 6,000 years. Hinduism began thousands of years ago in this area. Varanasi is also the place Buddha preached his first sermon, some 600 years before Christ, and is the birthplace of Jainism, an eastern religion similar to Buddhism and Hinduism. In addition, the Muslim population is about 15% and there is an Islamic seminary located here. But God is not dead, for the Lord is near to those who call on him. In the book of II Kings, we learn that even in the Godless fallen nation of Israel, God had preserved 7,000 men who had not bowed down to the Baals. So it was a great gift of God and a privilege to live and work for a couple of weeks with the faithful men and women of India who are working tirelessly and sacrificially to increase the Kingdom of God in North India. They come from all walks of life, from all castes. Some are pastors, engineers and successful businessmen. Many are just ordinary people, all convicted by the Holy Spirit. Through this group of dedicated Christians, Christianity is multiplying, one family at a time, one neighborhood at a time, one community at a time. I don’t know the conversion story of “I,” but he is a Muslim who is now a believer, and I understood that he has converted 35 other Muslims to the Lord. Praise God for men who are taking the name of Jesus to a group. When “A” converted to Christianity he was disowned by his family. He was also excommunicated from his community by the Hindi leaders. He did not speak to his mother for 14 years, but she secretly kept up with him all those years. Because of all the good work he was doing in other areas, he was eventually accepted back into his family, became a leader in his old community and has started several churches there. The “story” or testimony of one witness of what God has done for them has more strength than any other tool, including the Bible itself, in bringing men and women to believe in the Lord. Many of the people are illiterate, but not unintelligent. The stories they hear will be repeated over and over again to friends, families, and acquaintances. Sometimes we get in too big of a hurry. It has to be relational before transformation can take place. Don’t serve God like you are disabled. Serve God like God is with you. We must be faithful, but that is not enough. We must be fruitful, but that is not enough. We must finish. Some things seem impossible. With God, they become difficult, then done. Our common sense, compared to God’s sense, is nonsense. The church needs to be impressing, not imposing. Most churches are imposing. That’s why young people don’t want to go to church. In ministry you can’t sit around and wait for people to come to you. You have to go to them and build a relationship. Then they will come. When individuals change, their families can change. Changes in families lead ultimately to the transformation of the entire community.